Gavdi believes that good quality support ensures the sustainability of a well-implemented software solution. With over 200 SAP support customers, Gavdi understands what it takes to deliver unrivalled support to our customers. As such, we have developed a service concept around support that we call ‘Application Value’ which optimizes the value that an organisation gets out of its SAP solution, whether that be SAP HR ‘on premise’, SAP SuccessFactors or a ‘hybrid’ of the two. 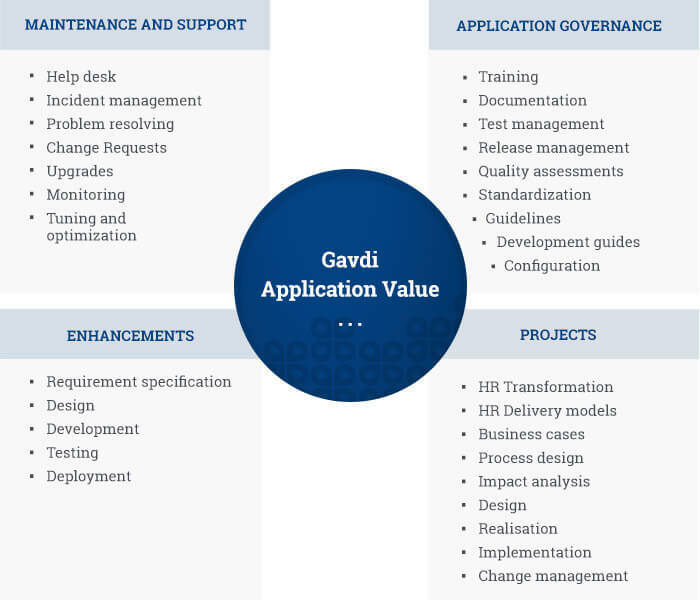 Gavdi Application Value consists of a range of services which are tailored to each individual organisation’s needs. It is designed to support organisations of all sizes and SAP deployments and is delivered to organisations that may, or may not, have internal support resources. Today, Gavdi Application Value supports local, national and international organisations – from small and medium-sized enterprises up to 1,000 employees, to local authorities, government departments and global enterprises with more than 50,000 employees. Gavdi provides this service in more than 45 countries for more than 200 SAP installations.